Price Reduced!! 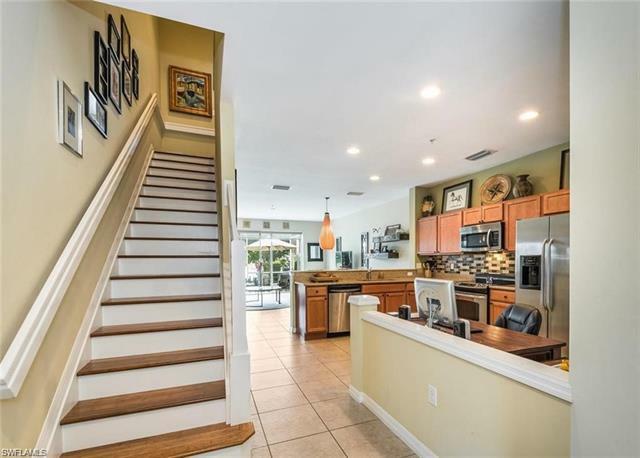 Come see this absolutely gorgeous townhouse located in the desirable gated community of Verona Pointe. This home features 3 bedrooms, 2.5 bathrooms and a 1 car garage. The kitchen boasts stainless steel appliances, wood cabinetry, granite counters, and glass subway tile backsplash! The open concept great room floorplan is tastefully decorated and the long lake views from this home are nothing short of perfect, especially from the private screened lanai! The upstairs features engineered hardwood flooring in stairway, hallway and all three bedrooms. Verona Pointe has a community Pool & Spa and is located in North Naples with easy access to I-75, shopping, dining and just a short drive to the beach! Verona Pointe also has very low HOA fees, only $264 per month which includes Basic Cable, Exterior Pest Control, Irrigation Water, Lawn Maintenance, Security, Rec Facilities and Reserves, making this home one of the BEST VALUES in Naples! Make an appointment to see this fabulous residence today! These Townhomes qualify for FHA and VA Financing!